We firmly believe in the proverb – “Reading is to mind, what exercise is to body“. And therefore, it is important about paying attention on what you should read. Otherwise there remain a danger that you may injure yourself. We hence, share our genuine personal reviews for various books and magazines we come across, so you can decide whether you should go for the specific media or not. If you are a regular reader of Thinkerviews, you surely know that Reader’s Digest is one of our favourite magazine and we regularly present our reviews for almost every issue of its India edition on regular bases. There are exceptions of course, sometimes we didn’t get our copy on time, sometimes we got quite busy with some other stuffs,… We however like to present our views only after reading each issue, or otherwise it will dishonesty towards our readers (and of course with ourselves too). This time the subscriber’s copy didn’t find us on time, and we bought a copy from the news stand earlier in January. 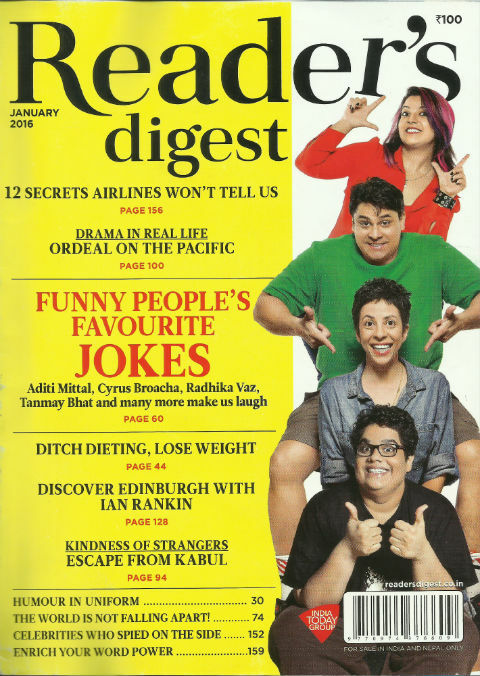 Here are our thoughts about the January 2016 issue of Reader’s Digest Magazine (India Edition). The cover page of this issue is canvased on Yellow and white background with black and red text. It looks decent and clean. The photographs of 4 well known Indian comic artists makes you to think finding some humorous stuff inside. So let us take a dig. The editor have to be attentive to the latest happenings and Sanghamitra seems honest towards her role. Her notes about inclusion of an EMOJI in Oxford dictionary are interesting. It also gives us the idea about how the way we are communicating is changing so fast. The article about – Toni Rüttimann – titled as The BridgeBuilder features in – Everyday Heroes. He is an engineer and have expertise in (yes you got it right…) making bridges. It may not sound that different, but what he uses his skills for, is quite different. Actually rather than talking much about his good work here, we insist you to read the article. Art Of Living – segment talks about – Diet Advice which you can ignore! It is quite interesting to read about something like this, otherwise, we often are advised to follow diet tips. The article is based on some research study results. However, only a certified (or expert in the area) dietician can comment on it’s accuracy. The cover story – Funny People’s Favourite Jokes – could have been much better. And being a cover story it could have been longer too. It is quite possible that readers have expected more here as the names of well known humour artists (or should we say comedians?!) Cyrus Broacha, Tanmay Bhat, Tanmay Bhat, Aditi Mittal, Radhika Vaz. We are not revealing any jokes from the article to keep your interest intact. Notes From My Father article by Dave Colangelo is good article with good emotional quotient. The article was originally published in the Canada edition of Reader’s Digest in June 2015 issue. The article is available to read here. The article focuses on the natural facts about males. Usually they are not very expressive when it comes to emotions (compare to their female counterparts). Probably that is why, there is much written about mother-child bond, but comparatively less content is found about father-child relationships. This article is good to read in that terms as well. The World is NOT Falling Apart By Steven Pinker & Andrew Mack is about optimistic approach we can use to see the current happening. It is quite easy to be pessimistic in the current time due to the growth of terrorism we see around the world. A series of natural disasters is quite evident of the fact that the nature is returning us the results of what we did with it. But wait, there are some good things also to consider. It is up to us that what we want to see here. Actually we found this entire article available here. Add to the positive aspects, there is a small article taking notes of medical breakthroughs achieved in the year 2016. It may not be found very interesting by all the readers. But, it is still worth to go for it, at least once. Escape from Kabul explores real life experience of Anil Kumar Nigam. How an unknown driver named Sher Ali helped him by going out of the way to escape from dangerous situations of Kabul and catch a flight to come to India; is written pretty realistically. Such incidents prove that if you want to do good things (or right things) all you need is a pure heart. Sher Ali put his own life into danger to save lives of the people he even do not know. Ho cannot we consider him a genuine citizen of the world. Actually it is people like him, who makes the world the better place to live. Kudos to him. Real Life Drama – segment comes up with a drama titled Ordeal on the Pacific. It is about how a boat race become real challenge for four Englishmen. It is not less than a miracle that they are survived. The article is written in interesting manner. It rather give you the feeling of reading a movie story (though the incidents are real). Worth reading to be more optimistic in life. Smartphone Slaves is the most contemporary article of this issue as per our vision. We personally expect this article could have been written in even more detail. The heading of the article says it all, and that is true. Being active on Social media and use the technology at its best (using smartphone) is something great and must be appreciated for sure. But, only when it is done in proper way. One needs to decide the boundary. And till you are the master (or in control) it is fine, but if you become a slave of it, it is going to give you more nightmares (and sometimes you may not even realize it). the article is a must read for everyone. Of course you need to have an “open mind” approach to read it. We suggest to go for it. Thank you for the guitar is a good article, again exploring human emotions. The new year wishes are given with some interesting photographs you will love to see. Ian Rankin’s Edinburgh – is a delight for those who love to explore various areas of the world. The article is detailed and written like it has to attract tourists. It accounts the facts and facilities pretty well. Angel on High – is an account of a female rope walker. How she came out of poor childhood and tricky situations with the help of a genuine fellow, how she learnt rope walking, how she got married (later she got divorced too) and all the aspects of her real life journey are written well. There is always a danger to be over praising or biased, when writing such article. The author however is in control and have explored it in balancing manner. A tale of hard work, supportive world and determination are the essence to take from this article. Definitely worth reading at least once.